AAA is part two of their Cuautitlan taping, with the (spoiler) Murder & Monster betrayal of Dr. Wagner. I do not expect we’ll get any more explanations about why that happened on this show, but maybe later. CMLL Claro has Volador vs Yoshitatsu! and other things. Puebla has a 11 minute Rush vs Ultimo Guerrero match. The late night Lucha Retro airing is repeats, for what it’s worth. I suspect they may have more episodes taped that won’t air, but I don’t know that for a fact. What happened: Rey Cometa & Cavernario sort of feuded in the main event, which I guess is supposed to be a feud going forward, but it just seemed like what they were doing on this show. The only other notable thing happened is Triton got a haircut before I did. What was good: I liked the semimain, but it’s likely the boredom of this show broke me down and the good grade was more an indication of my will breaking. This is not a good use of two hours. Emperador Azteca replaced Laredo Kid. Excellent match. Golden Magic beat Extreme Tiger. There’s clips of the main event up already; this is missing the start and is clipped, but has a lot of it. Arena Lopez Mateos looks full, which is a rarity on any show, much less a Wednesday night one. Tao Lucha also says they sold out last night’s AAA show in Arena Queretaro. AAA spot shows are running two to four thousand seat arenas, but they seem to be drawing well in those. The latest Podcast Boom is shot, but has some news: Miguel Fonseca, who’s most notable as an AAA assistant booker for many years, is said to also be gone from the company. Fonseca also did public relations for the company. I’ve always assumed that when there were text interviews with wrestlers on the site (which would be seen by much more people in newspapers to promote the company), they were actually Fonseca writing the quotes for the luchadors knowing the direction of the storylines. Those interviews have disappeared lately. Like Oscar García Jiménez, Fonseca was a guy who’s been with the office for years and it’s surprising to see him go. Garza Jr. & Laredo Kid appear to be starting with Impact this week. Konnan will also be there, and mentioned those two on his podcast. There’s a lot of turnover on their roster right now, so no idea how they’ll be used. Garza’s had interest from TNA in the past, and both have had WWE tryouts. This obviously stems from Impact being at the last Crash tapings and talent being shared back and forth. Those guys are not under Lucha Underground contract, unlike other people in The Crash, so they’re free to show up elsewhere. Konnan also mentions there was a plan to have the Lucha World Cup in Japan, but the Japanese sponsors wanted The Crash (or probably more specifically the Pentagon/Fenix/Rey guys) and AAA said no to that. I’m not ready to rule out a 2017 Lucha World Cup from happening, but we should start hearing about it this month if it is, and they’ll have a lot of obstacles to overcome. 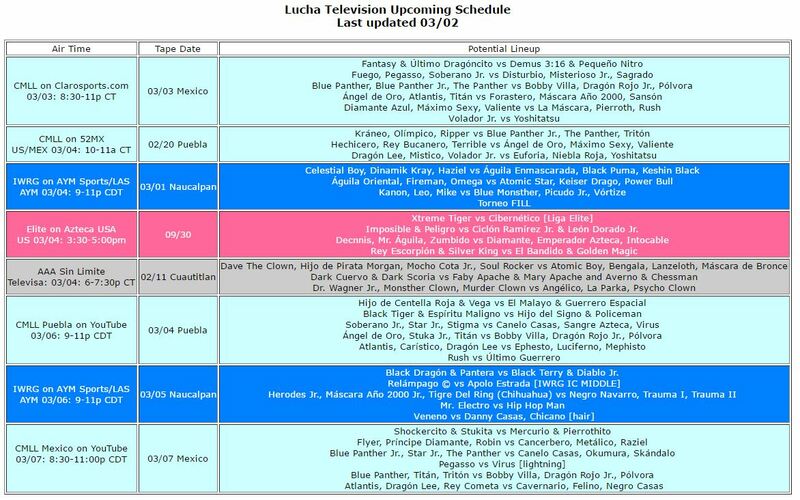 I mentioned this on the TV lineup post, but Mesias is listed as being in Orlando the same time he’s supposed to be in Neza. He’s not the only one; Vampiro is also signing autographs on Friday & Sunday. It’d probably be a good thing for AAA to have a presence at WrestleCon, face to face interaction is their best bet at changing their perception in the wrestling industry, but that appearance means new director of talent Vampiro is going to be out of town during one of his first TV tapings in that role. Man At Arms, one of the upcoming new series for El Rey, is said to be debuting in early June. That fits with the idea that El Rey pushed back airing Lucha Underground to have new episodes on the air when their other new programming launched. The lucha libre segment with Conan O’Brien learning lucha libre from Casandro, Magnus, Pasion Kristal Yuriko and others aired last night, and is up on their website. There’s also a bonus behind the scenes video. Pierroth says he’s going to send Diamante Azul back to France, via the post office. Sam Adonis says he’ll have a mask on Sunday. Dragon Lee was doing a TV interview on Thursday, so he is around even if he’s missing shows. Villano III did a round of interviews on Wednesday, as part of the hype for Homenaje a Dos Leyendas. He says his biggest win was taking Perro Aguayo’s hair. That’s not a feud that comes up a lot out of Mexico but is definitely one of his biggest. An interview with the Mexico City Hijo del Medico Asesino reveals he got tattoos so people could tell he’s not the Tijuana Hijo del Medico Asesino. His claim to the name is his father brought the rights to the name from the original’s family, then passed it down to him. Lucha Memes announced a 03/25 show at Puebla’s Arena Coliseo San Ramon. First match announced is Centella de Oro vs Hechicero. WUW announced a lot of AAA and other luchadors for 03/25, including Psycho Clown, Pagano, Drago, Lady Shani, and Lady Apache. NJPW announced this year’s Best of Super Juniors tour will run from May 17th to June 3rd. I expect Dragon Lee will be part of it. Sagrado & Nitro are headed back to France’s APC in July. RobViper has highlights of 06/09/16 ELITE. A visit to the lucha libre themed Taqueria Chabelo. Chabelo’s a frequent sight at and sponsor of lucha libre shows. What happened: UG fouled Rush, leading to a singles match next week. Espíritu Maligno and Policeman had problems. What was good: Nothing. Euforia/Volador was the best thing on the show but clearly not close to the best thing they could be doing.